Wow! What a difference 24 hours can make. It’s about 3pm, Monday, the 3rd of December on the Branscomb Glacier. But today we have absolutely clear blue skies overhead. Most of us are out milling around our mountain tents and our pyramid tarps around the snow walls. 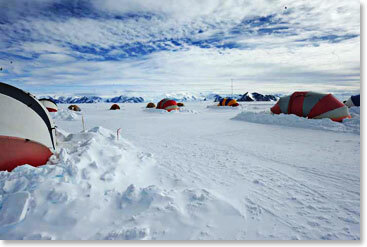 We just had a big breakfast of bacon and pancakes, which taste really good in Antarctica by the way. We got a weather report from Mark, the meteorologist at Union Glacier, which is relayed via David, who is managing Vinson Base Camp, far below us on the Branscomb Glacier now. The weather report has not greatly changed, we still have, and I can see very, very high winds up near the summit of Vinson. But the winds are beginning to diminish in the coming days, so things are heading in our direction. Our plan right now is to stay here. Try to get some snow off of our tents, and from the inside of our tents, dry out our gear a bit, eat and hydrate well, which is easier to do at this elevation. Sleep here one more night and tomorrow we are going to try to get an early weather report at 11am from David and if things are trimming in the right direction still, tomorrow, Tuesday, we’ll head back to High Camp. From there we’ll have to see, but we’re certainly encouraged that Mr. Vinson, the summit of Mt. Vinson, is beginning to be closer within our reach and perhaps just a few days away. So, I’ll sign off now from the Branscomb Glacier. Life is good in Antarctica. Vaughan and I are doing well, and we’ll keep you updated day to day.